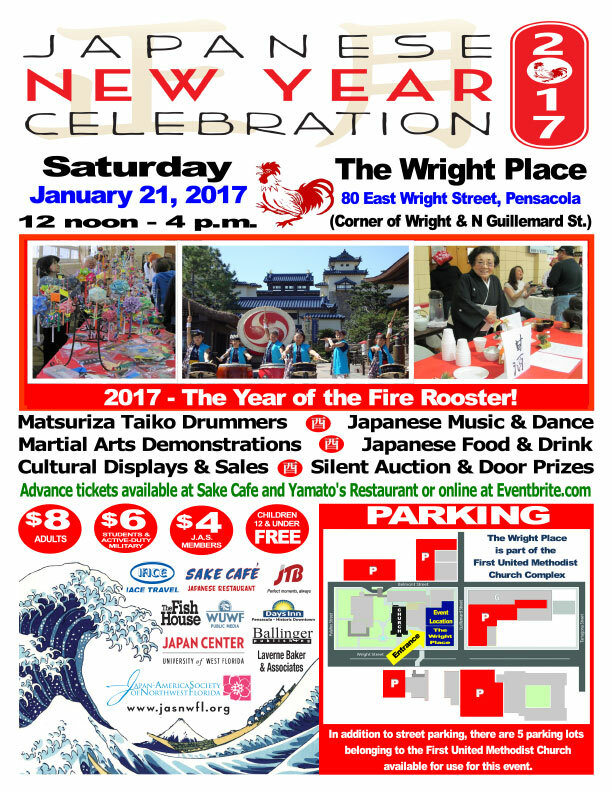 The Japan-America Society of Northwest Florida will usher in the “Year of the Fire Rooster” with its 23rd annual Japanese New Year Celebration on Saturday, Jan. 21, 2017, at the Wright Place in Pensacola. Festivities will take place from 12 noon until 4 p.m. and will include performances by the popular Matsuriza taiko drummers, martial arts demonstrations, traditional Japanese dancing, music, food vendors, and other cultural displays. A silent auction will also be held, and ticket holders are automatically eligible for door prize drawings. Ticket prices are $8 for adults, $6 for students or active-duty military, and $4 for Japan-America Society members. Children 12 and under enjoy free admission. Ticket prices are $8 for adults, $6 for students or active-duty military, and $4 for Japan-America Society members. Children 12 and under enjoy free admission. Advance tickets are available from Sake Cafe and Yamato’s, or online at Eventbrite. The Wright Place is located at 80 East Wright Street and is part of the First United Methodist Church complex. In addition to street parking, there are five lots adjacent to the church that are available for this event. Contact us for more information, or click here to learn about becoming a JAS member.